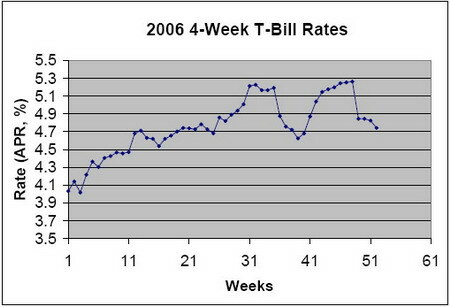 Here's a complete chart of the 4-week T-bill rates of 2006. Overall, the rates were on the rise throughout the year. It was just above 4.0% when 2006 began, gradually moved up and peaked at 5.263% on November 30th, and ended the year with a 4.742% APR, a 17.6% annual increase in rates. The sharp drop in rate in the week of December 7th coincided with the decline of dollar versus Euro and the rise of the gold price. On December 3rd, one Euro bought 1.3341 dollar, a 20-month high, and gold was traded close to $650 an ounce on December 1st, reflecting investors sentiment on the perspective of future US interest rates. With the current rate of 4.742% APR, my taxable equivalent yield (EAPY) is still 5.18%, better than what EmigrantDirect or HSBC offers me. Click here to see how you can calculate your own taxable equivalent yield if you want to invest in 4-week T-bills.